AS investigators dig deeper into the misappropriation of funds from 1Malaysia Development Bhd, a portrait of Rosmah Mansor as the central force in the international scandal is taking shape, The Wall Street Journal reports. 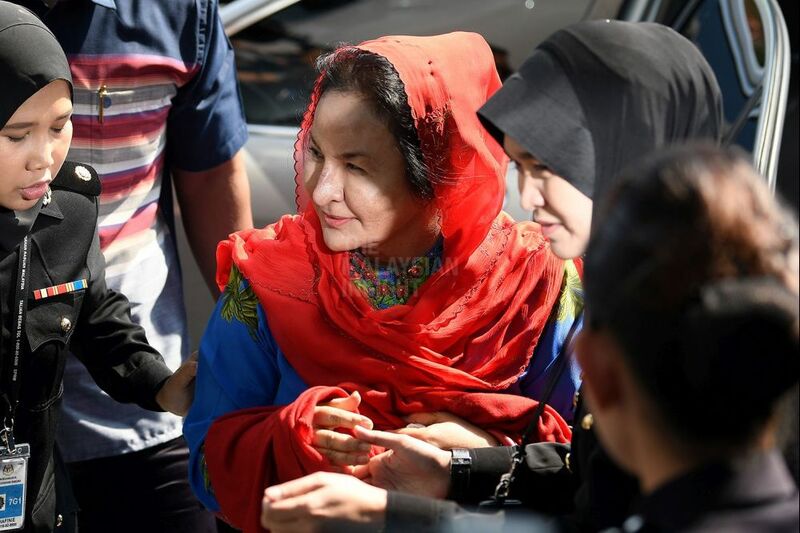 In interviews with investigators and people close to the wife of deposed prime minister Najib Razak, the financial daily said Rosmah’s pursuit of wealth was a crucial factor in driving Najib’s government deeper into corruption. People close to her believe Rosmah’s desire for wealth was sparked when she was exposed to inordinate wealth growing up on the palace grounds of a sultan, despite her parents being middle-class school teachers. She was described as a gifted and determined student, but felt insecure around affluence. Rosmah’s friends say she had planned to marry into the family of the sultan of Brunei. After a first marriage to a businessman, Rosmah wed Najib in the 1980s, when he was still Pahang menteri besar and she was working for a property company. Rosmah grew enamored of the perks of power, said people who know her. She insisted on being addressed as “First Lady of Malaysia”, or FLOM and began flying on government jets for shopping in London, New York and Los Angeles. The couple are reportedly devoted to each other, with the criticisms and investigations over the 1MDB scandal drawing them closer together. It is unknown whether investigators believe Rosmah had a personally directed the complex transactions that diverted funds from 1MDB. People who know her say she facilitated the alleged involvement of a young Malaysian financier who the US Justice Department (DoJ) says helped set up 1MDB and then oversaw its looting. The U.S. agency is involved because it believes U.S. assets were among those purchased with graft proceeds. DoJ has filed civil suits seeking to seize nearly US$2 billion (RM8 billion) of such assets, including a private jet, luxury homes on both coasts and a film production company headed by Rosmah’s son from her first marriage. The suits target assets, not individuals, but include allegations against figures believed to be connected to the scheme. The suits say at least US$4.5 billion was misappropriated, which would make 1MDB one of the largest-ever financial heists. Last August, DoJ applied to the courts to suspend the civil proceedings so it could focus on a criminal investigation. In Malaysia, the attorney-general appointed by Najib cleared the then prime minister in 2016 of any wrongdoing connected to 1MDB. Associates of Najib believe he was only partly in the loop of his wife’s activities as he focused on obtaining funds for political uses rather than personal spending. “The wife had more of a picture than the husband,” said a person regarded by US investigators as having played a key role in the alleged heist. Najib wanted to resign as investigations intensified in 2016, said people who know the family. One said Rosmah urged him to stand firm, calling the affair a “test from Allah”, and that she helped lead efforts to block investigations in Malaysia. Last year, Rosmah helped hire American lobbyists to urge DoJ to drop its 1MDB investigations, said a source. This person said Rosmah dialled into one meeting between the lobbyists and Malaysia’s ambassador to the US. Rosmah has also hit back at critics of her lavish spending habits. She described such criticism as politically motivated. “I have bought some jewellery and dresses with my own money. What is wrong with that?” she wrote in a 2013 autobiography. Raids on Najib residences in last month found RM114 million cash stuffed in suitcase, as well as jewellery, watches and 284 luxury handbags, valued at thousands of ringgit each, many of them unused in original boxes, according to police. Sources say when the couple moved into their Kuala Lumpur mansion, some in the family thought it too luxurious for a political couple, but the matter was dropped after Rosmah became angry. The forceful Rosmah, who took a work space and staff in the prime minister’s office, often prevailed over the less-decisive Najib. When Lee Kuan Yew, the founding father of Singapore, met Najib in 2009, Lee asked that Rosmah also attend, commenting to Singapore media that he’d heard the pair worked as a team. A Malaysian businessman who says he was dependent on Rosmah for annual renewals of his government licenses said some of the Hermès Birkin handbags found in Ms. Rosmah’s residences were gifts from him. People who know Rosmah said a desire for international recognition drew her into an alliance nearly 10 years ago with young Malaysian financier named Low Taek Jho, also known as Jho Low, who the US Justice Department has said was at the heart of the 1MDB scheme. Low has denied wrongdoing. Malaysia has a warrant outstanding for his arrest. He is believed to be in China. Low’s family owned property near Najib’s residence in London, and he had befriended prominent Persian Gulf families while studying at the University of Pennsylvania’s Wharton School. Rosmah, who looked up to Middle East royalty, was impressed and became Low’s champion. In 2009, Low helped establish 1MDB, to spend government money to spur development. Najib gave Low wide latitude to handle 1MDB, according to people who worked there. Low set up a shell company called Blackrock, unrelated to the US investment firm, to hide 1MDB funds, investigators say. He used the shell company to buy Rosmah jewels, telling friends “rock” stood for diamonds and “black” for the first lady’s heart. A source said he chartered yachts and private jets for her. On Najib’s first official trip to the U.S. as prime minister in 2010, Low arranged for a double-page advertisement in The New York Times, costing more than US$100,000, to hail Rosmah for her “courageous acts in making a difference” to people around the world. Rosmah wanted to meet Hollywood stars, a source said, and an associate of Low organised a star-studded party at the St Regis hotel in New York to welcome her. Low was consulting with her son from her first marriage, Riza Aziz, on the formation of a film production company, and secured the attendance of Robert De Niro and Jamie Foxx at the party. Foxx emceed and danced with Rosmah, said someone who attended. De Niro later travelled to Kuala Lumpur following an invitation from Rosmah, who told local media she wanted the actor to see Malaysia. When investigations of events at 1MDB began making progress in 2015, Rosmah pushed the prime minister’s office to state that her wealth was in line with Najib’s “legacy family assets,” according to a person familiar with the matter. Najib’s four brothers responded with a statement saying they had been left little money by their father, Abdul Razak Hussein, who was frugal as prime minister. Rosmah reacted angrily, claiming the brothers would bring down the prime minister, said one family member. Investigations into 1MDB proliferated in the U.S., Singapore, Switzerland and elsewhere, while those inside Malaysia were stymied during the Najib years. Mr. Low privately pointed the finger at Rosmah. “She is an avid purchaser of jewelry in the millions. Where is the money from?” one associate recalls Low saying. Rosmah has accumulated a large collections of pink diamonds, according to a Malaysian businessman who said he helped select some of the gems. One diamond she acquired was worth US$27 million, according to DoJ. A man US investigators believe played a critical role in the 1MDB affair – and who has also described helping procure diamonds for Rosmah – has estimated her collection’s value at US$350 million. Low was expected to supply Rosmah with handbags and diamonds, according to people with knowledge of the relationship and to Justice Department lawsuits, while she used Najib’s credit cards, paid for using 1MDB money, for shopping at Chanel in Hawaii and an Italian jewellery store, according to Malaysian investigative documents. Malaysia’s new attorney general is reviewing those payments as part of its criminal investigation of Rosmah, said people familiar with the probe.– June 26, 2018.